Are you starting to see brown spots on your summer lawn? 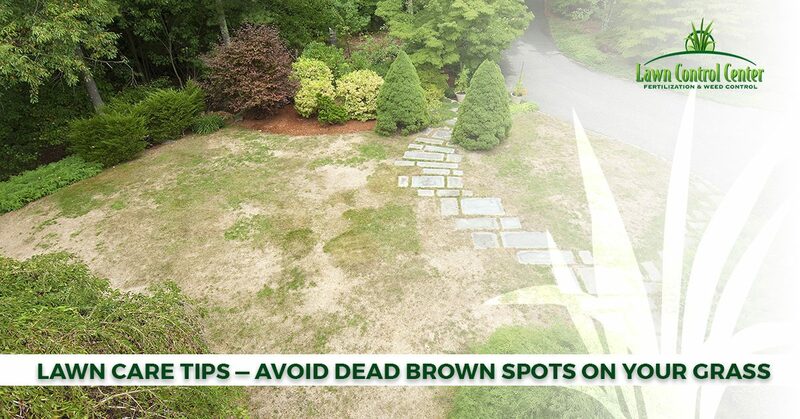 Read on to learn about some common causes of brown spots and how to prevent them from taking over your lawn. If you are in the Columbus or Cleveland area and are in need of lawn care services, contact Lawn Control Center today! Usually irregular in shape, brown fungal spots often appear after extremely rainy or humid weather. While you can’t control the weather, you can combat lawn fungus with an application of lawn fungicide. Grubs eat roots, and when grass is cut off from its roots, it will naturally turn brown. If you suspect this is the problem it is important to kill existing grubs and prevent them from returning. Dog urine, which has a high amount of nitrogen, is one of the most popular and common reasons for brown patches on lawns. To remedy this situation, try using a dog spot repair or contacting your lawn care professionals for other solutions. Swimming pools, waterslides, and other objects that you place on your grass can suffocate the grass and quickly damage your lawn. Simply removing these toys and treating your grass with some TLC will help it recover. Mowing your lawn at the right height and time can make all the difference when it comes to appearance and fighting of any turf disease. To make sure you get the most out of your mows, consider sharpening your mower blades, avoiding mowing when the grass is wet, and don’t remove more than ⅓ of the height of the grass at one time. Many of the diseases that affect lawns are caused by moisture and when the grass blades are wet. To keep your lawn from getting too wet, it is necessary to water only when your lawn needs it and to water deeply so you can go longer in between watering. Lawn care professionals recommended watering your lawn in the early morning, which gives your grass plenty of time to dry throughout the day. If you begin to notice brown spots on your lawn, before you immediately jump to the control materials, first try some natural alternatives, like raking up the brown spot. This can help to dry the spot and hopefully cause any brown patch fungi to return to dormancy. Need Professional Lawn Care Services? If you are in the Columbus or Cleveland area, we’d love to help! From lawn care to pest control, we are your go-to professionals. View our services and schedule your appointment today.